As longtime residents we are often asked for recommendations on places to go for amazing food and experiences on Maui. 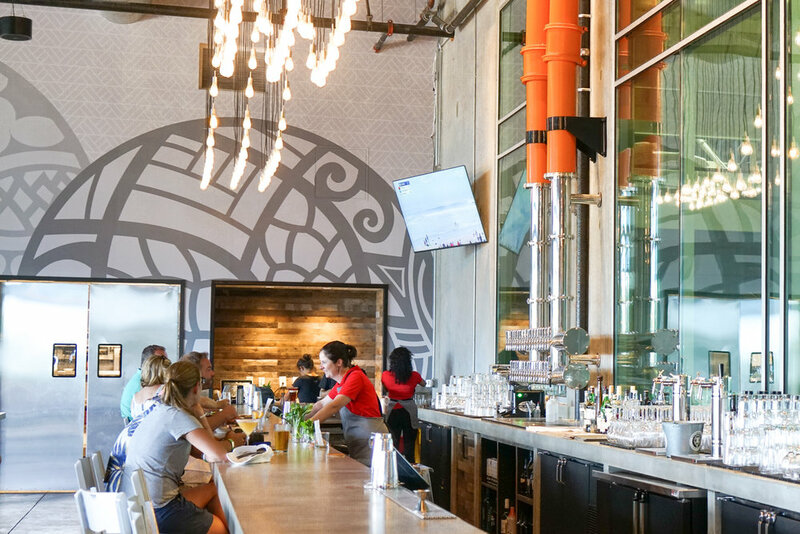 Here on the blog we will be sharing some of our familyʻs favorite local spots, including one that has become a must for visitors and locals alike, Maui Brewing Company. Lovers of craft beer know that quality make all the difference when it comes to the experience of a good brew–from the first sip to the service provided upon order. Fortunately, Maui can indulge the avid beer connoisseur a mere 10 minutes from our condos on the south side of the island at Maui Brewing Company. Though the company was established in 2005 and the Kihei brewery and tasting room have become a popular spot for daily libations in the last few years, the restaurant itself is the latest addition which opened its doors this year. The 8,500 square foot space is a warm, open-air dining room that boasts an impressive menu including over 36 local brews as well as hearty, island-inspired cuisine. Recently leading the restaurant team is celebrated chef Jojo Vasquez, who has famously trained under acclaimed Iron Chef Masaharu Morimoto on the hit show. But Vasquez is a powerhouse in his own right, garnering high praise with the success of several restaurant openings in Kapalua and Honolulu, earning him the title “Maui Chef of the Year,” by Maui No Ka ʻOi Magazine in 2017. His unique style of “Hawaiian eclectic” cuisine draws inspiration from seasonal produce grown in Hawaiʻi, heartfelt cultural comfort food, artful presentation, and, now, flavor profiles that perfectly complement (and utilize) the companyʻs own local brews. Upon our last visit we were blown away by a new menu special by chef Jojo which included rich prawns atop a crisp crostini slathered in savory tomato jam and swimming in a decadent butter sauce…it was divine! Maui Brewing Company is also expanding upon itʻs alcohol-free offerings as well, which includes our familyʻs favorite root beer, with cola and ginger beer to come! There is truly something for everyone at the restaurant, aside from being a popular hang out to wind down from a long week or to catch up with friends! But donʻt take our word for it, check it out yourself and visit Maui Brew Company in Kihei for a tour of their on-site brewery facility, a tasting adjacent to the restaurant, or an unforgettable meal.